In what is certainly the most enticing phone we've seen at CES thus far, Sony's Xperia Z1S is heading to the U.S. as a T-Mobile exclusive, and it looks like an absolute powerhouse (as does its little buddy, for those who like smaller phones). Where to begin? It's an Android phone with a 5-inch screen that looks much like last year's Xperia Z, but with slightly more-rounded edges. That screen is a full 1080p, and it uses a new "Triluminos" display technology from Sony's Bravia TV group. It boasts a wider color gamut and better color gradients without unnecessary over saturation. It also has an "X-Reality for mobile picture engine," which recognizes when there are bits of data missing (from streaming video, say) and it will intelligently work to replace the missing pixels for a better picture. Under the hood is Qualcomm's beastly quad-core Snapdragon 800 clocked at 2.2GHz, 2GB RAM, 32GB built in storage (plus a micro SD card slot for up to 64GB more), and a 3,000mAh battery. What else? How about improved water-proofiness? It's been upgraded from IP57 to IP58, which means you can now submerge it in water to a depth of 4.5 feet for up to 30 minutes. It also now has an open waterproof headphone jack, so you don't have to fiddle with annoying panels or worry about listening to music poolside. It brought back the physical camera button, so you can take photos underwater. And speaking of the camera, here's where things get really interesting. The camera features the new aspherical Sony G Lens, which the company claims lets more light through to the sensor. It also opens to a very wide F/2.0. Behind the lens is a custom-designed 1/2.3 inch sensor (same size that's in most compact point-and-shoot cameras) that clocks in at 20.7MP. It uses the BIONZ picture engine which Sony claims gives it better, faster image processing by utilizing the Snapdragon 800. Sony says that you can zoom in up to 3x with optical zoom quality, though we have yet to confirm that for ourselves. Another interesting, and frankly brilliant, thing about the camera is that the built-in camera app is now sort of modular. Put another way: You can now download apps for the camera app. They're called Xperia Smart Applications, and a bunch of them come pre-installed, though you'll be able to download more (both from Sony and from third-parties). For example, there's Background Defocus which takes two exposures: One sharp where you want it focused, and one sharp on the background. Then you can manually adjust the amount of background blur. Or there's Timeshift Burst, which takes up to 61 shots in two seconds (caching one second before you tap, and then shooting 30 more frames after). Then you choose your favorite. It fans out all of the shots at the bottom, so it's really easy to scroll through and see the motion. These are just two examples, but all of these apps, once installed, will exist within the phone's camera app, so you can always expand its capabilities without having to switch around or open new applications. There are more features, too, like deep PlayStation 4 integration (lots of unique "second screen features") and in addition to having Bluetooth 4.0, there's also support for ANT+, which means you can pair it with virtually any fitness accessory in existence (heart-rate monitors, cadence sensors, power gauges, etc). It will also run Sony's SmartLog app, which essentially turns your phone into a fitness tracker (using the Snapdragon's low-power core). It will come running Android 4.3 (Jelly Bean), but if there's one thing that makes us hesitate about this phone it's the software. Sony's phones have had a bad track record of making Android slower and more convoluted. Let's hope this is the one to break that tradition. 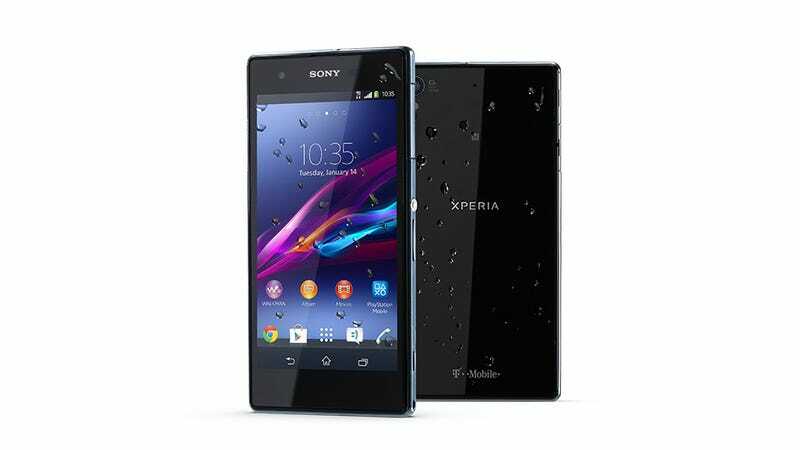 At CES 2013, Sony had the two most exciting phones in the show with the Xperia Z and Xperia ZL. But by the time they were finally released—seven months later—they were both handily outshone by phones like the HTC One and the Galaxy S4. Happily, Sony seems to have learned from this mistake. The Xperia Z1S will be available exclusively from T-Mobile on January 22nd (though if you're not on T-Mo and are willing to pop for an unsubsidized phone, you should check out the Xperia Z1, which is almost identical). It will be $0 down, with 24 equal monthly device payments of $22 on one of their Simple Choice Plans. Pre-orders begin January 13th, but keep checking back with us, as we should have our review up before then. In other news, Sony is also announcing the Xperia Z1 Compact, which actually sounds amazing if you're into smaller phones. It's got basically all of the goodness of the Z1S—same camera, same Snapdragon 800, same IP55/58 rating—but it's just got a 4.3-inch screen. It will be available globally in February in four different colors: White, black, lime, and pink. Unfortunately, "globally" often means "everywhere except the US." Hopefully you'll be able to get it unlocked at least, because there are a whole lot of people that are dying to get a smaller phone that doesn't sacrifice on specs. No word on price yet.